I'm not the biggest Kappa fan but this is my favourite shirt from them in my collection so far. The combination of the blue and white is very well done. Typically the blue part is the primary colour so it's interesting when the roles are reversed. The diagonal lines at the bottom of the shirt work very well in my opinion. Unusually for me, I think the club logo being located in the center of the shirt is actually the best position for it to be in. The sponsor also fits in great with the overall look of the shirt. The blue and white colors recall the coat of arms of the city. The third suit, it is often made from colored champagne, referring to the prestigious beverage produced in the region, or pink, referring this time to one previous jerseys football teams of the city. 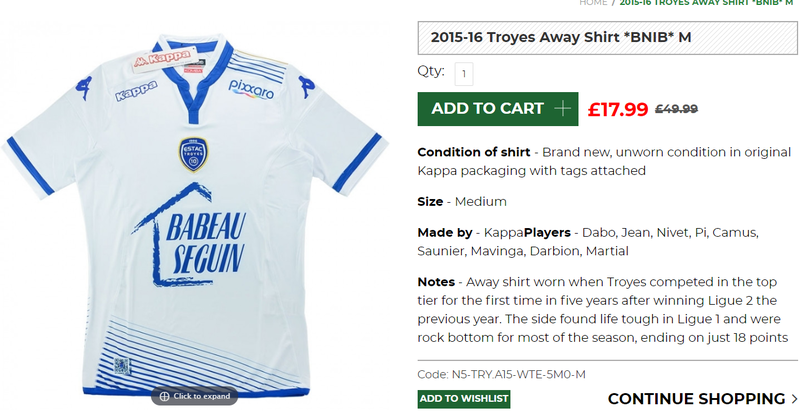 If the above has given you some inspiration to buy a Troyes shirt then why not buy one of theirs from this season. Clicking on the photo will take you to the retailer.